Beets are a year-round food group for me, and roasting them whole in foil is my cooking method of choice. This herb dressing is citrusy and crisp with the orange zest and shallot, and the pistachios offer an added bite and sense of satisfaction. The dressing can be served over a variety of vegetables, but I love the aesthetics of this dish: the bright green herbs over the deep purple beets. Roasting them with a cinnamon stick and bay leaf gives them added spice and warmth, and I prefer keeping leftovers right in that same baking dish for as long as possible. Serve at Thanksgiving, or enjoy at lunch or dinnertime. Add leftover beets to your on-the-go salad the next day along with a little bit of the dressing, and your tupperware will thank you for the added variety. Preheat the oven to 375 degrees F. Place the beets in a baking dish, such as the one below, along with the cinnamon, bay leaves, and water. Cover tightly with foil and bake for 1.5 hours, or until the beets are tender when you gently squeeze them. Discard the water, but keep the spices. Meanwhile, in a small bowl, whisk the shallot, vinegar, and a pinch of kosher salt. 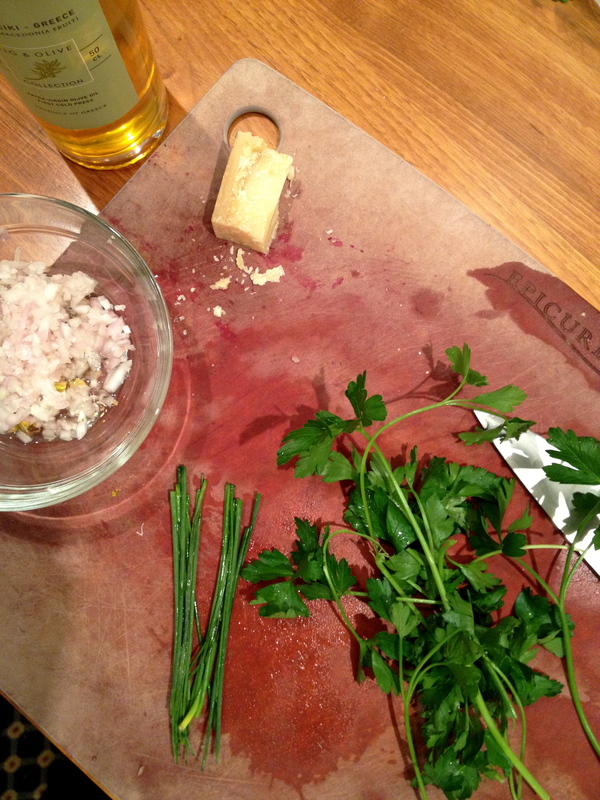 Let stand for ten minutes before adding the orange zest, parsley, chives, and olive oil. Remove the skin from the beets with a sharp knife (they should be tender enough that the skin comes off easily) and slice them 1/4 inch thick rounds. I arranged them in an overlapped circle, but feel free to try alternative styling. 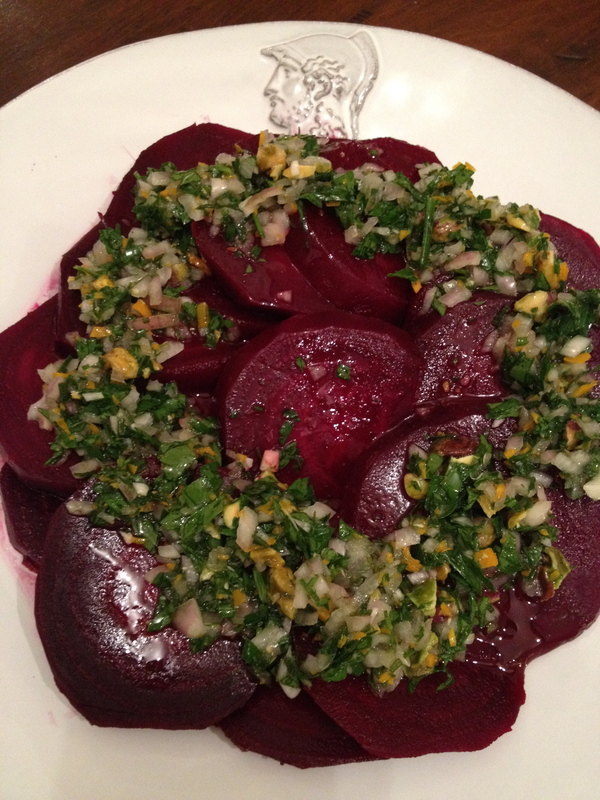 Add a drizzle of olive oil to the herb dressing if it seems too dense, and spoon over the beets. Scatter the pistachios on top and serve. 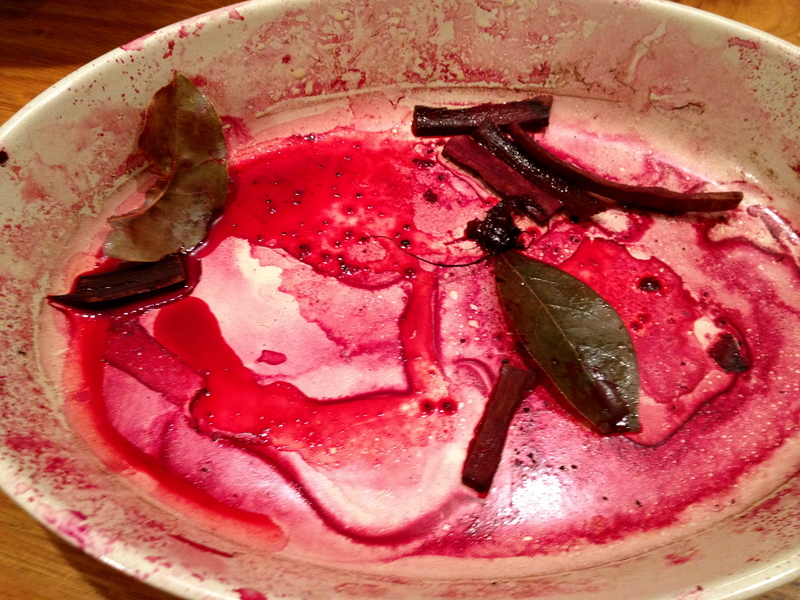 Leftover beets can be placed back in the original baking dish; they might as well soak up as much of that cinnamon and bay leaf flavor as possible. The beets can be made ahead and refrigerated for a day or two. The dressing can be made ahead and refrigerated separately from the beets for one day. Bring the dressing back to room temperature before serving. Care to join me in Paris for lunch? Goat Cheese and Zucchini Charlottes with Red Pepper Sauce. Just another Monday at Noémie’s.